Atlanta is a diverse city in the south east of the USA, located in the State of Georgia. The city has numerous claims to fame including host of the Olympics in 1996, home to Coca Cola and CNN, the largest aquarium in the world, the busiest airport in the world, and home to many celebrities including the late Whitney Houston, Ludacris, Usher and, at one time, Elton John. Atlanta has in recent years become a very popular location for filming, and at any given time, you can be sure there is at least one movie being filmed here. Just recently the Hunger Games II film unit set up camp just around the corner to my office. The popular TV show “The Walking Dead” is also filmed here.Atlanta itself is what I would call a “suburban city”. It’s a city of rolling hills, dense with trees; of skyscrapers interspersing with residential bungalows, cottages, Greek revival homes, and sprawling estates. 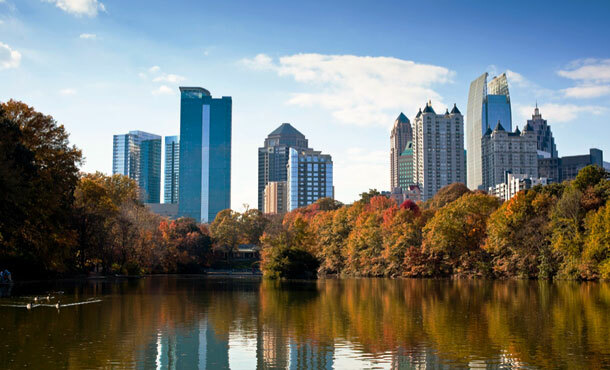 For the sake of simplicity, I will divide Atlanta into 3 sections – Downtown – largest business district/sporting venues, Midtown – 2nd largest business district, art and cultural center, home of Piedmont Park; and Buckhead – 3rd largest business district, home to two upscale shopping malls and home to the Governor. Outside of these three main areas, the very funky and hip Decatur/Virginia Highlands/Little Five Points/Fourth Ward borders to the east, and the very cool “Westside” borders to the, well, west… So it’s a city with different pockets of areas to visit, and a city, unfortunately, with a transport system that needs a complete overhaul – a car is necessary for exploring. And it’s worth exploring. Atlanta has everything – it’s just a case of finding it! There is a thriving singles scene, dictated mostly by the various “meet-up” groups that exist, and world-class shopping, restaurants and nightlife. There is also a great expat community (thanks of course to EuroCircle), and a large number of European pubs/eateries. It can get very hot here in the summer, with mosquitoes the size of F16s, and, with no ocean to escape to without a 3-4 hour drive, many Atlantans escape to the north Georgia mountains to cool off. Atlanta fringes on the Appalachians, and just an hour or so north are the Blue Ridge mountains. Hiking, white-water rafting, and mountain climbing are just some of the activities available in these areas, but if you prefer something more relaxing, there are also several good wineries to visit. It can get cold in winter – in fact, it’s snowed for 5 years out of the 6 that I’ve lived here. And trust me when I tell you – when it snows, the city comes to a complete halt. Seriously. Even if it’s a light dusting – the world here stops. So if you come and visit, spring and fall may be the best months. We look forward to seeing y’all!